Turkish president Recep Tayyip Erdoğan is back in the news again this week to dispel any doubt that he is hellbent on assuming authoritarian powers. 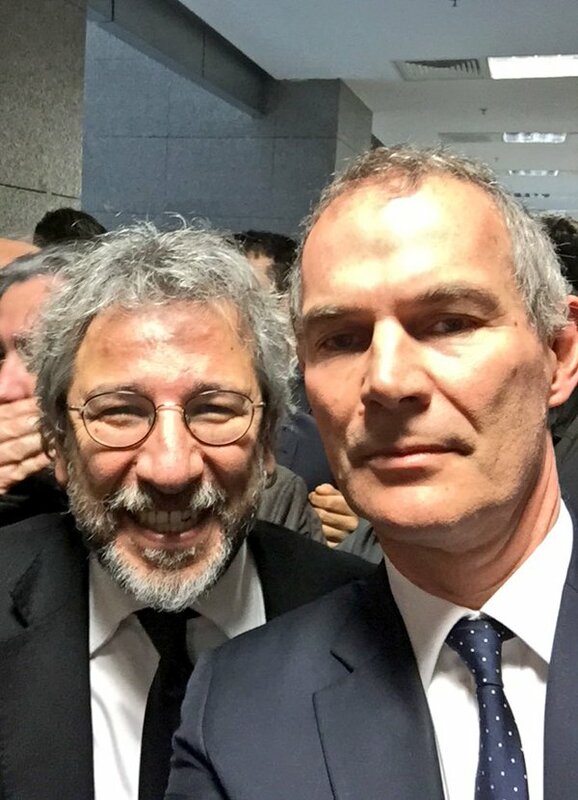 The latest subject of his wrath none other than Britain’s consul general Leigh Turner over a “selfie” taken at the espionage trial of two journalists. We previously discussed the outrageous prosecution of Can Dündar, editor of the Cumhuriyet newspaper, and his colleague Erdem Gül – a direct attack free speech, free press, and political dissent. Turner with other diplomats showed up to support civil liberties in Turkey at the start of the trial. That led to another tyrannical outburst from Erdoğan who has added diplomats to the list of undesirables in his new Islamic dominated government. The journalists published a video showing how Turkey’s state intelligence agency was helping to ferry weapons into Syria by truck in 2014. This led to charges of terrorism and a demand for life imprisonment by the Erdoğan government. The Turkish foreign ministry issued formal expressions of displeasure to foreign governments over social media postings from the trial. In the meantime, the court added to the abusive prosecution by agreeing to hold the trial behind closed doors so the world could not witness the farce that passes for justice in Turkey under Erdoğan. This trend was evident recently with the rounding up of dozens of professors for simply signing a petition denouncing military operations against Kurds in the south-east of the country. The effort to secure life sentences for two journalists is a demonstration of the sense of impunity that Erdoğan enjoys with the support of Islamic parties and supporters. He also, of course, has the support of the United States government which views him as a key ally as he ravages the rights of political dissidents and journalists. Perhaps he wants to recreate the Ottoman Empire, become a sultan. I’m guessing he won’t be apologizing for the Armenian Genocide. Probably thought those were the good old days. Absolute power corrupts, and he’s already well on his way. Who is CPS? Certified Personal Secretaries? So, where’s the “here” where the buck stops? Gonna get down to it! Yes. When Western corporations want full control over their operations in any country, it is much easier to work with a single dictator than to deal with a larger body of decision makers. Dictators are preferred. Developing democracies, on the other hand, have historically required brutal military regime change. Turner with other diplomats showed up to support civil liberties in Turkey at the start of the trial. Doesn’t sound very diplomatic at all. Quite the opposite, as a matter of fact. And all Turkey did in response was protest? It takes a bit of work to make a clown like Erdogan look like a superior diplomat, but somehow the UK through its consul general just managed it. A protest on behalf of (and with the approval of) his government is one thing. But this “diplomat” didn’t do that. He took to personally criticizing his host country… on Twitter. I suppose writing insults on the bathroom wall in crayon might have been more amateur, but not by much. Is this why we can’t say Islamic terrorism? And this is another one of our allies and a possible member of the EU…we have such great friends!